I had very mixed emotions on Rosh Hodesh Sivan when I went to pray at the Western Wall. This Rosh Hodesh (new month), as on each Rosh Hodesh for almost 25 years, Women of the Wall conducted services. However, this month was unique. In the 1980s when I was in Israel as a student, one of the highlights of my time in Israel was the ingathering of Jews as they streamed to the Kotel on Shavuot morning. In observance of Shavuot as one of the three pilgrimage festivals, since 1967 Jews flock to the Western Wall at dawn after studying all night in anticipation of receiving the Torah at Sinai as marked by this holiday. In the 1980s, liberal Orthodox Jews joined the Conservative and Reform Jews in prayer in the open plaza behind the section of the Wall dividing the men and women. In effect, there were three sections for worshipers—men, women and mixed. This plaza area was used by thousands of mixed synagogue and youth groups over the years as they came to the Kotel to pray according to their custom, with no mechitza (division of men and women) until it was decided that this was no longer allowed by the ultra-Orthodox Kotel administration. In one of the last such groups that took place on the holiday marking the destruction of the Temple, Tisha B’Av, police forcibly dispersed the mixed group (of which I was one of the participants) in the middle of our prayers at the first sign of any opposition. Despite having received all the required permits, cooperating with the police, and being non-confrontational, we were forcibly evicted from the Kotel plaza (I was placed in a headlock by police) because several ultra-Orthodox men started shouting at us. Ironically, this was on the day commemorating the destruction of the Temple, which tradition explains occurred because of blind hatred among Jews. 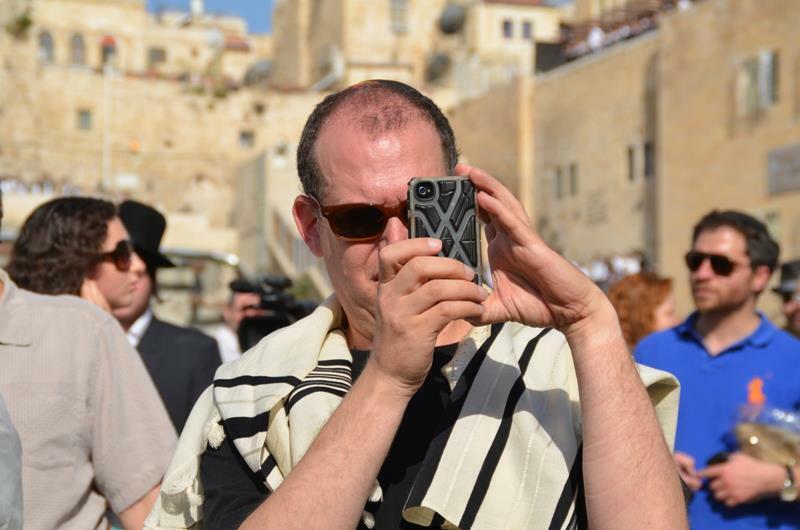 The thinking behind the police action was that the mixed group was a provocation and was not according to the traditional practices at the Kotel. This conclusion was deduced and put into effect, despite years of practice to the contrary. This thinking extended to Women of the Wall, an all-women group consisting of Orthodox, Conservative and Reform Jews who pray and read Torah at the Kotel each Rosh Hodesh. For the last few years, Women of the Wall would pray in the women’s section of the Kotel and then disrupt their own service and move to Robinson’s Arch in order to read from the Torah. Robinson’s Arch is part of the Davidson Archeological Park and a continuation of the Western Wall. However, it is not conducive to prayer with limited space and is not open to individuals to pray unless they pay admission or make advanced reservations and arrive before 9 a.m. There is no mechitza at this section of the Wall and this is also a problem for Women of the Wall, some of whose members are Orthodox and want to daven in an allwomen’s prayer group segregated from men. Over the last decade, synagogues, youth groups, and b’nai mitzvah who do not want to be divided by a mechitza have not been allowed to pray in the Kotel Plaza, but have been relegated to Robinson’s Arch. According to Bonnie Riva Ras, a board member of the Women of the Wall, Women of the Wall “never accepted our exile there and the space has been very problematic for us.” A couple of months ago, Women of the Wall decided they would no longer pray at Robinson’s Arch. Returning to the Kotel, the women were warned in a letter from police that they would be arrested. According to Ras, she was arrested because she wears a tallit and the police told her that this was an action that could disturb the sensibilities of other people and could lead to public unrest. However, the court ruled in favor of the Women of the Wall and in the landmark verdict handed down and upheld against the police’s appeal in April this year, the view of the authorities was reversed. Judge Moshe Sobel in Jerusalem District Court decided against a police appeal, fully supported the Magistrates Court decision by Judge Sharon Lary-Bavly, which stated that there was no cause for arrest and that the women who were arrested in April did not disturb the public order. Judge Sobel stated that the legal proceedings of Women of the Wall establish that the “local custom” is to be interpreted with national and pluralistic implications, not necessarily Orthodox Jewish customs. Thus, the accused women did not violate this law. David Barhoumone, one of the lawyers representing Women of the Wall, said, “The fact that the District Court adopted the ruling of the Magistrates Court bears great weight, and this shows a changing legal reality which will affect any future arrests of Women of the Wall. There is no doubt that this decision is crying out and calling to the authorities to change their approach to the prayers of Women of the Wall.” Horowitz asserted. In a turnaround reflecting the courts’ rulings this month, when the women returned to pray, police protected and defended them. However, a new player debuted on the scene. Several weeks before Rosh Hodesh, three women formed Women for the Wall. They invited women who are happy with the status quo to come and pray as a group on Rosh Hodesh Sivan. The result was over 10,000 women (many seminary students who were bused in) packed beyond the women’s section and filling the plaza area of the Kotel. Leah Aharoni, one of the founders of Women for the Wall, told me that this was not meant as a protest and she was surprised by the number of women who showed up. They had expected women to come and pray together within the women’s section. Aharoni and her peers called on women to come and pray on Rosh Hodesh. She said that this was not to launch a protest, but to empower individuals who are coming anyway and instead of feeling alone, to come and unite as a group. Aharoni’s view of women’s empowerment is not to adapt men’s attributes (as she views Women of the Wall—many of whom wear a tallis and tfillin), but to find their own voice in unified sisterhood and this is what she sought to do in forming Women for the Wall. Aharoni feels that Women of the Wall are using the Kotel as a place to raise a political agenda and that this is inappropriate. Such protests, according to Aharoni, should be made through due process within the Knesset and the courts. The Kotel is a place to pray. I do not think that Women of the Wall would disagree. As the court stated, these women are not disturbing the public order, they merely come to pray. Aharoni stressed that Women for the Wall were not looking to create a confrontation or a further rift among the Jewish people. Women for the Wall has reached out to the leaders of Women of the Wall to work together in sisterhood and come up with new solutions. I must be naive. The courts have said the Women of the Wall are not breaking civil law. The rabbis have said that the Women of the Wall are not breaking Jewish law. To me, both women’s groups appear to be saying the same thing: Women should come together to pray in the one place that we all consider to be the holy epicenter of the Jewish people. I hope that next month, a women’s prayer group will take place that really represents the broad spectrum of religious Jewry with mutual respect. It is a well-established Jewish teaching that women are on a higher spiritual level than men. Let’s hope they can lead us in a better way to a better place. This entry was posted in Home in Jerusalem, Published in The Jewish Community Voice of Southern NJ and tagged Israeli politics, pluralism, police on June 26, 2013 by charlie.